Only for men above 18 years of age. 1 (one) capsule twice a day or as recommended by healthcare professional. Regular exercise recommended for optimum results. 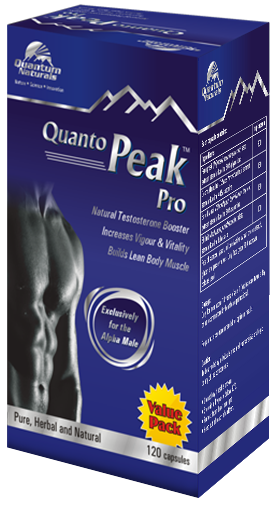 Quanto Peak Pro has been created especially for alpha males to help them increase strength, vitality and stamina. 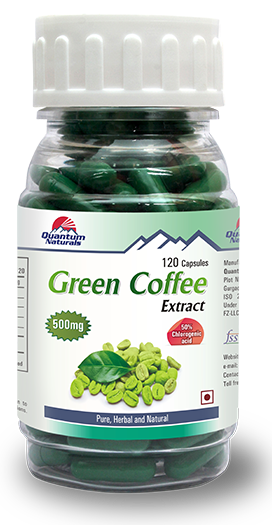 Each capsule of Quanto Peak Pro constitutes of natural and pure extracts of Tribulus, Shilajit, Fenugreek and Safed Musli. These ingredients results in improved masculinity, increased strength and better composition. 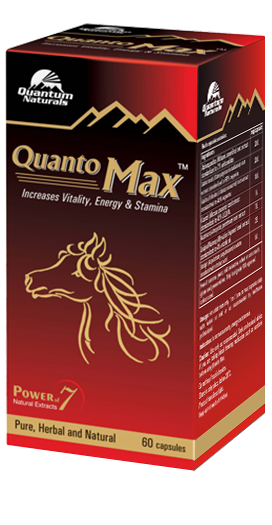 Quanto Peak Pro helps in gaining maximum power thereby enhancing performance. Quanto Peak Pro is 100% natural and free from chemicals and heavy metals. Fenugreek is herb cultivated in many countries including India, Egypt, Middle East and North Africa. It has shown to have strength boosting activity within physiological limits. Since it is derived from food chain raw material, it is an inherently safe product. Fenugreek is commonly used in many parts of the world. 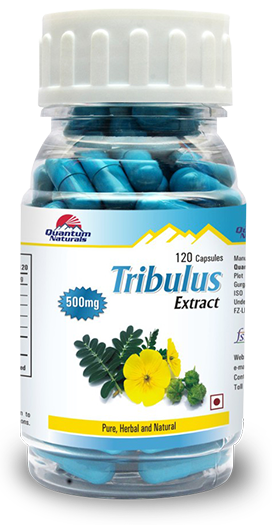 Tribulus terrestris is a flowering plant native to the warm temperate and tropical regions of Europe, southern Asia, Africa and Australia. "It's used to produce large gains in strength and lean muscle mass,”. "It has also been touted to increase masculinity in men." Safed Musli, popularly known as Musli is a strong herbal aphrodisiac, widely used by men to overcome physical weakness. The roots of this plant contain saponin and different alkaloids that makes it useful as a powerful tonic that helps in curing weakness in men. The roots of this plant have been used for centuries in various Ayurvedic and Unani medicines in India and its subcontinent. Shilajit is one of the valuable gifts of Mother Nature, which has astounding benefits. 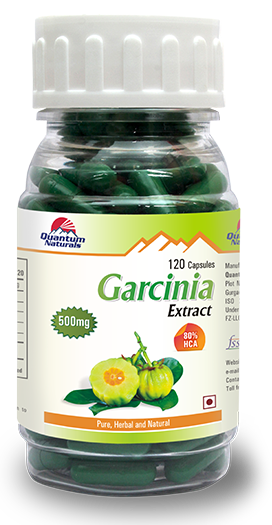 Enriched with vitamins and minerals this herbal supplement is capable of curing a wide range of physical disorders. 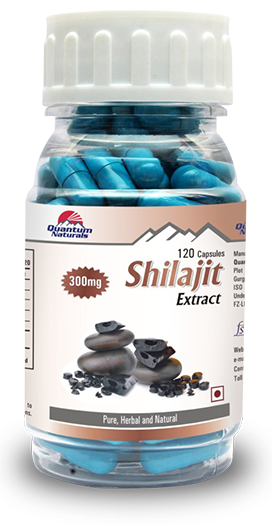 Shilajit enhances the energy level of the body by hastening the cell metabolism that is essential for daily activities. It acts as a natural aphrodisiac and improves the physical performance in men. Who should use Quanto Peak Pro? 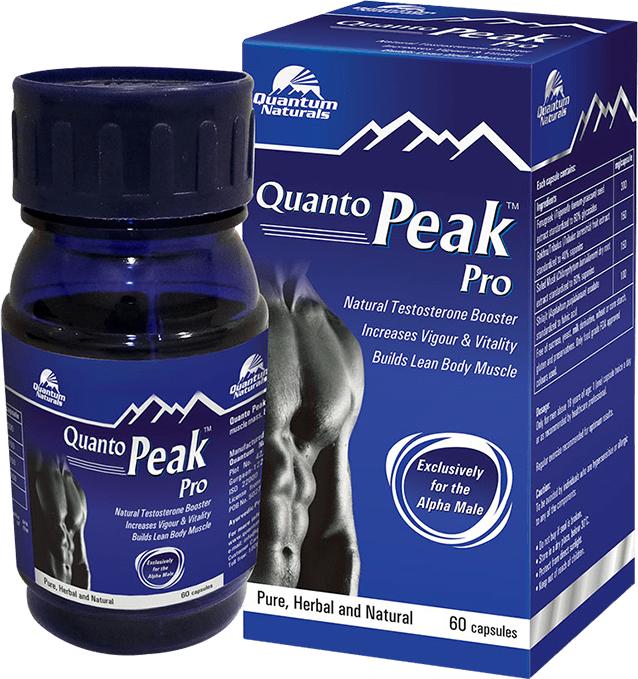 Quanto Peak Pro is to be used only by men above 18 years of age who experience some common symptoms such as decrease in strength/endurance, lack of energy, emotional fluctuation, deterioration in the ability to play sports and work performance. Is Quanto Peak Pro safe? 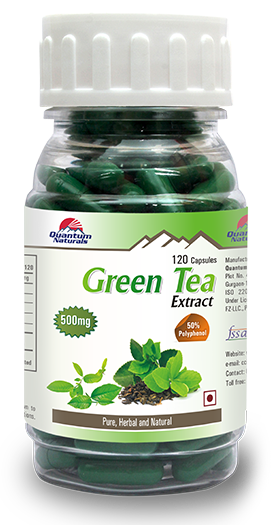 Quanto Peak Pro is safe as it contains pure herbal extracts. There are no observed side effects. In case of any adverse effects please consult your physician. Does Quanto Peak Pro interact with other medications? Quanto Peak Pro is not seen to interact with other medications. In case of any adverse reaction, please consult your physician. Is any specific diet or lifestyle change required? No change in diet or lifestyle required. Regular exercise improves results. Why is regular exercise recommended? Regular exercise will lead to better body composition by improvement in lean muscle mass with a reduction in body fat. When will the effects of Quanto Peak Pro be noticeable? The effects of Quanto Peak pro will start within 2-3 weeks. Results may vary with individuals. What if one does not see any effect of Quanto Peak Pro? Take an additional capsule 30 mins before dinner. can one smoke, consume alcohol when under the treatment of Quanto Peak Pro? No studies have been conducted with Quanto Peak Pro for biological or physical interactions with alcohol or nicotine. However, it is advisable to avoid alcohol or smoking while being on Quanto Peak Pro.